Peacock orchids are not true orchids, but rather relatives of gladiolus. These plants reach 28-40 inches. Their stems are adorned with a few close flowers , shaped like a curved funnel with a long neck. 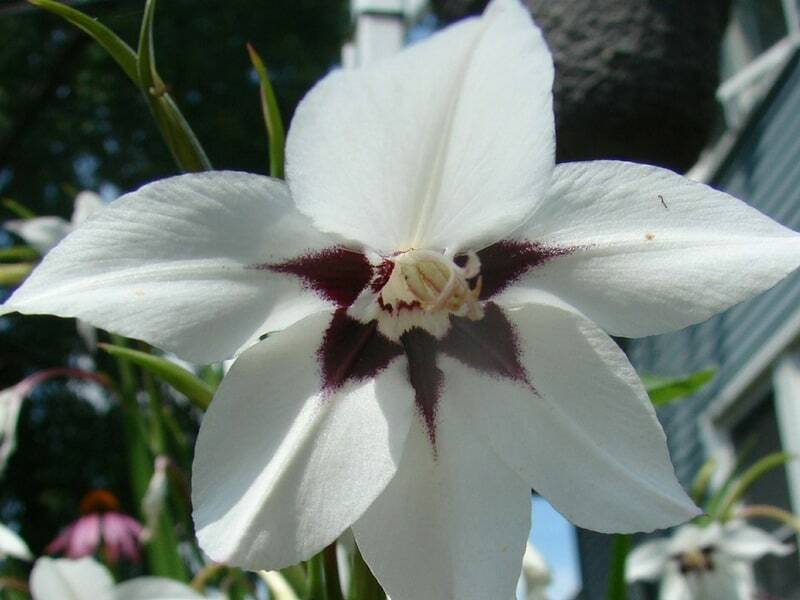 They are white with a purple ring and purple markings at the center, and have a strong, sweet fragrance. Buy corms as soon as they are available in nurseries in your area. Plant then as soon as the danger of frost has passed. For waves of blooms, plant them one to two weeks apart. Set corms (bulbs) in soil about 4 times deeper than their height, and about 4 to 6 inches apart. They’ll start blooming about 65 to 90 days after planting. This plant needs full sunlight and lots of heat to develop flowers. It can thrive outside in the summer against a sunny wall. Water well in summer and feed 5 to 6 times during the season. In the winter, keep the corms dry. The Acidanthera bicolor love a rich, fast draining garden soil. If your soil is poor, mix in some fertilizer and and compost before planting. The fastest way to increase your plants is to divide the corms and remove the offsets which grow on the “mother” tuber. Plant them in pots or trays and keep them inside for the first year.They will begin to flower after 2 or 3 years. If you have more patience than money, you can also plant seeds in April or May. Sow them in rows an inch or two apart, then move them out into individual pots when the seedlings are a few inches tall. Seeds propagation requires a lot of patience as corms need several years to grow large enough to produce flowers. The corms can be used for several years in succession, but they are very sensitive to cold. If you live in zone 7 and above, you can let the corms in your garden. Otherwise, move them indoors before the temperatures start dropping in the fall. Trim away withered leaves, dust corms with diazinon and store them in single layers in flats or trays between 40F and 50F. They look quite impressive if several are grouped together in large bowls or tubs. They work really well in borders and containers. Plant them in your cut flower garden for a burst of fragrance. 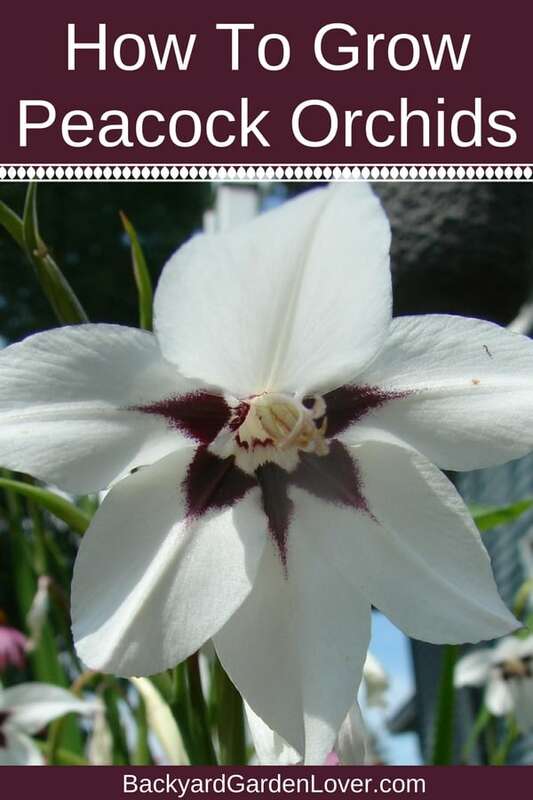 They are a good addition to your sun porch, living room, a warm patio or balcony and against a garden wall. It’s not hard at all to grow peacock orchids: give them a try and enjoy their beauty and fragrance.